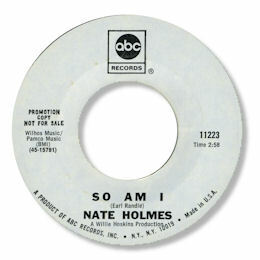 Nate Holmes spent most of his career as a guitarist and occasional vocalist with the Ray Charles band. So Am I was his only solo release but what a great one it is - not just for the playing of the Charles orchestra (check out the great lead guitarist - Holmes himself??) but particularly for the intense screaming vocal from Holmes. Surely with pipes like these he should have recorded much more often but sadly it was not to be. These days Holmes is still in the business as a key member of the west coast band the Blues Barons.